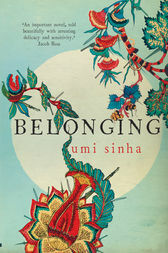 Set during the years of the British Raj, Umi Sinha's unforgettable debut novel is a compelling and finely wrought epic of love and loss, race and ethnicity, homeland - and belonging. Lila Langdon is twelve years old when she witnesses a family tragedy after her mother unveils her father's surprise birthday present - a tragedy that ends her childhood in India and precipitates a new life in Sussex with her Great-aunt Wilhelmina. From the darkest days of the British Raj through to the aftermath of the First World War, BELONGING tells the interwoven story of three generations and their struggles to understand and free themselves from a troubled history steeped in colonial violence. It is a novel of secrets that unwind through Lila's story, through her grandmother's letters home from India and the diaries kept by her father, Henry, as he puzzles over the enigma of his birth and his stormy marriage to the mysterious Rebecca.